Flash Player is a plug-in (see sidebar) that most people have installed on their computers. Many websites require Flash Player in order to view interactive or multi-media content in the form of applets like Flash movies. Some plug-ins are part of your browser and some, like Flash Player, have to be installed and updated. Since so many websites use Flash content like movies, most of us want to have the Player installed so we can enjoy and use that content. Why is Flash Player a security issue? The fact that the Player has to be installed and regularly updated combined with the ubiquitous use of Flash content on the web makes it a popular target for malware authors. Malware authors trick you into installing their nefarious software by telling you your Flash Player is out of date and then mimicking the look of the Flash Player updating process. Flash Player is used on both Macs and PCs, which means this isn’t a Mac or PC-only issue. When and how should I update Flash Player? If you have Flash Player installed, you will receive a notice from Adobe that an update is available. The notice will pop up on your screen when you are browsing and say an update to Flash Player is available. This could be real or it could be fake. When that window pops up with instructions for updating Flash, close that window then go to System Preferences to Flash Player (bottom row). Click on the Updates tab and then click on the Check Now button. If there is an update available it will come up. If you are up to date you will receive a message that Flash Player is updated. Keep your flash up to date and make sure once you download it you also install it. It's always a good idea to be skeptical of product installers, especially those that suddenly show on your screen in a pop-up window. When in doubt, quit your browser and call a Geek! If you receive a “Blocked Plug-in” message when trying to view Flash content in Safari, this means that the Flash Player is outdated. 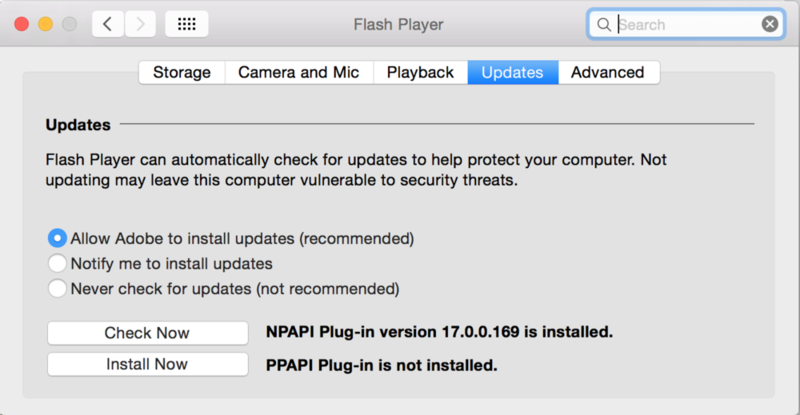 Follow the steps above for updating Flash through System Preferences. Is this Flash Player a problem for my iPhone or iPad? Flash was not included in iOS (the operating system for iPhone and iPad) and will never be included in iOS mostly because of these security vulnerabilities along with other performance issues. For more on how to deal with malware and viruses, please see our post, "Viruses, Adware, and Malware, Oh My!" Please feel free to comment below and let us know if you have a topic you would like to learn more about in a future post! A short computer application mainly for performing a simple specific task.